Did you use Vine? If so you’ll likely want to download all of your Vine videos before they disappear for good. We’ll show you how to download any and all video archive from the Vine service, it’s pretty simple and can be done with any web browser, there’s no need to break out curl or derive a DIY solution like what was once necesssary. And yes, if you never used Vine from your iPhone or Android, this will be totally irrelevant to you. For some quick background, Vine was a little social network that allowed users to upload short 6 second video clips which looped endlessly. Eventually the video sharing service was consumed by Twitter who then decided to end the Vine service completely, and there’s no a limited time period to get your videos off of the service before they might vanish for good. You’ll find the zip archive containing all the archives labeled something like “archive_1281249128412.zip” in your default downloads directory. Unless specified otherwise, on the Mac this is usually the ~/Downloads directory in the Users folder, and on Windows it’s usually found within My Documents. Once you unzip the zip archive, you’ll find a folder labeled something like “archive_1281241231” which contains an index.html file and an images and videos directory. If you load the index.html file in your web browser, you’ll find a nice interface to browse through your Vine archive with video looping and thumbnails, and with date and time stamps of when they were originally posted to the service. You can also access the Vine videos directly, which end up being mp4 video files, and unfortunately do not include any date or time stamp in the file name, meaning you’d be at a loss to figure out when the data is from. 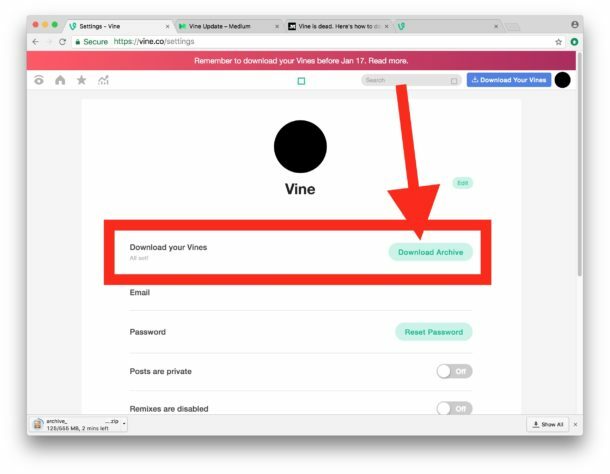 If you do have Vine or did use the Vine service, you should act fast and download your Vine archive as quickly as possible. The service shuts down officially soon, and after that it’s likely on a matter of time before you’ll no longer be able to access your data and the vines will be gone for good. Does this include your liked videos? Do you know how to mass download those?